Did I ever mention that I hate throwing up? Well, it hasn’t happened to me (or Leanne) yet, but we’re wondering if it might be coming. Yesterday morning, we were woken up early by a sick Hannah, and Isaac joined the party last night after we were all in bed by puking first on our floor and then on his bottom bunk. One thing that I hate almost as much as throwing up is cleaning up someone else’s puke. So far we’ve survived. The kids seem to be doing pretty well this morning, but you can keep Leanne and I in your prayers. Leanne called from church this morning, and her call was interrupted by someone else tossing the cookies. Leanne is supposed to leave Tuesday afternoon for a conference in Chicago. Obviously, the stomach flu never comes at a good time. Until the next post, does anyone have a carpet cleaner that we could borrow…? 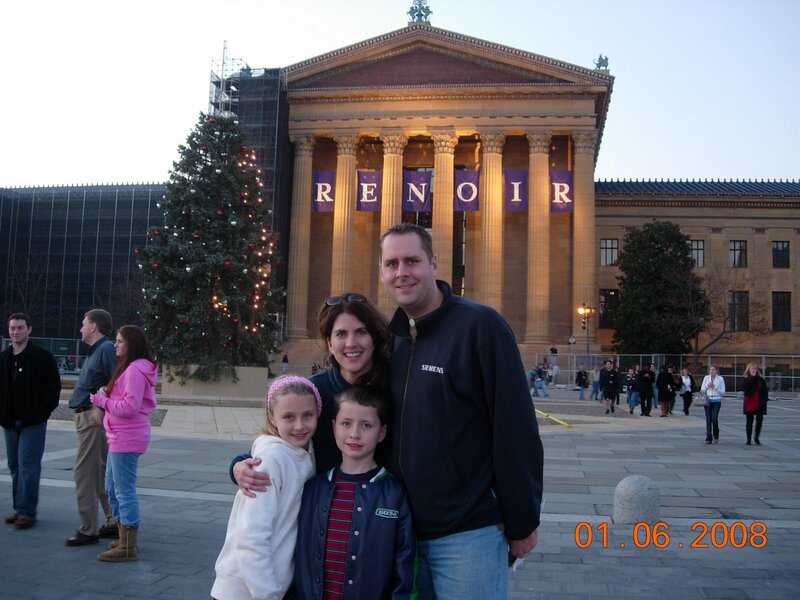 Last Sunday afternoon, our family took a field trip to the Philadelphia Museum of Art to enjoy the last day of the Renoir exhibit. This trip was fantastic. The exhibit was packed, but that was to be expected. The Renoir landscapes were spectacular. The museum provided head sets for each of us that permitted us to get a more detailed perspective on many of the paintings. For me, it was refreshing to enjoy the museum from a customer standpoint instead of from the contractor standpoint that I’ve experienced over the past 2 1/2 plus years. After the kids finished running up and down the steps doing their best Rocky impression, we piled back into the car and drove the the Chinatown section of Philadelphia. Here we enjoyed dinner at one of the many Chinese restaurants. As we walked the streets of Chinatown, we thought often of our new niece and cousin, Elizabeth, who will be joining our family later this spring. Apparently, my great grandfather was quite a wild young man. He traveled by boat from Sweden and some how ended up in California. From what I understand, he got into trouble with the law and had quite a taste for alcohol. Somehow, he showed up one Sunday morning at the Salvation Army church looking to cause problems in his drunken stupor. While he was at the service, he never had the chance to make any trouble as he was too plastered. There happened to be a young lady at the service who had pity on my great grandfather. Eventually, she married him and he cleaned up his life and committed his life to Christ. As time went on, she had a son. When he was six (or so), they both died of some sort of illness. The story doesn’t end here. Grandpa Erikson later met another lady who he married. They had a daughter who became my grandmother. When my dad was younger, Grandpa Erikson passed away, and Grandma Erikson moved in with this family. For several years, Grandma Erikson would take my dad and my Aunt Elaine to downtown Oakland to put money in one of the red Salvation Army pots. They would take the bus downtown and put the money that she had set aside for this purpose. She told my dad that this was a way to show her gratitude for Grandpa Erikson’s first wife who had been so instrumental in introducing him to Christ. As Grandma Erikson grew older and she couldn’t make the bus trip any longer, she would send my dad by himself downtown with her money to deposit in the Salvation Army’s donation pot. This became an annual tradition. Since then, my dad has made a point every year to empty his pockets of any loose change into a Salvation Army pot. Dad has also been involved with the Salvation Army on and off throughout his career. A big reason for this is that he wants to continue the tradition by remembering the role that the Salvation Army has had it setting a Christian foundation for his family. I’m sure that Dad told this story because he’s great at telling stories; however, I’m know that the real reason was to pass along this tradition to my son and me. I am honored. One of the highlights to our trip to Dallas involves pecans. My parents have two pecan trees on their property, and they have collected close to 20 gallons of pecans that have fallen from one of the trees. 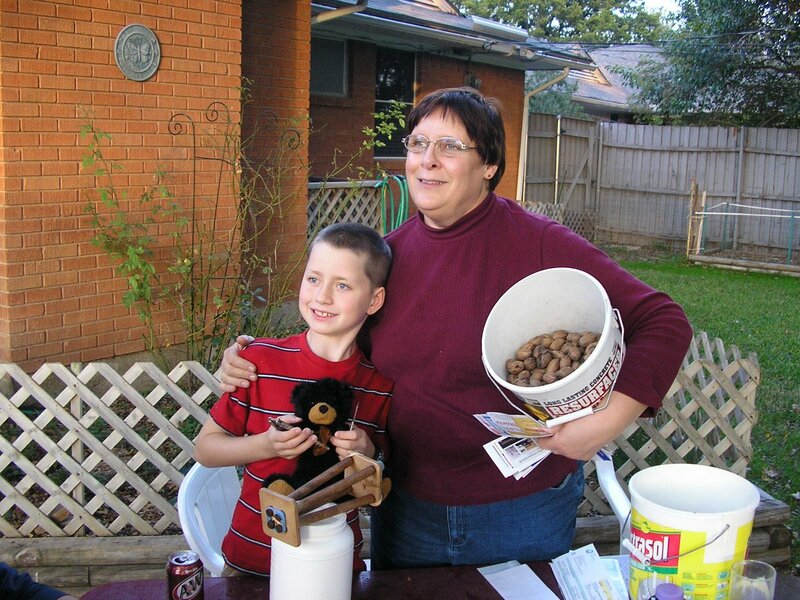 Believe it or not, one of the highlights for us was sitting on the backyard patio shelling pecans in 70-80°F weather. Hopefully, we helped make a small dent in Mom and Dad’s collection. They were generous in sending us home with two big zip-lock bags of pecans. 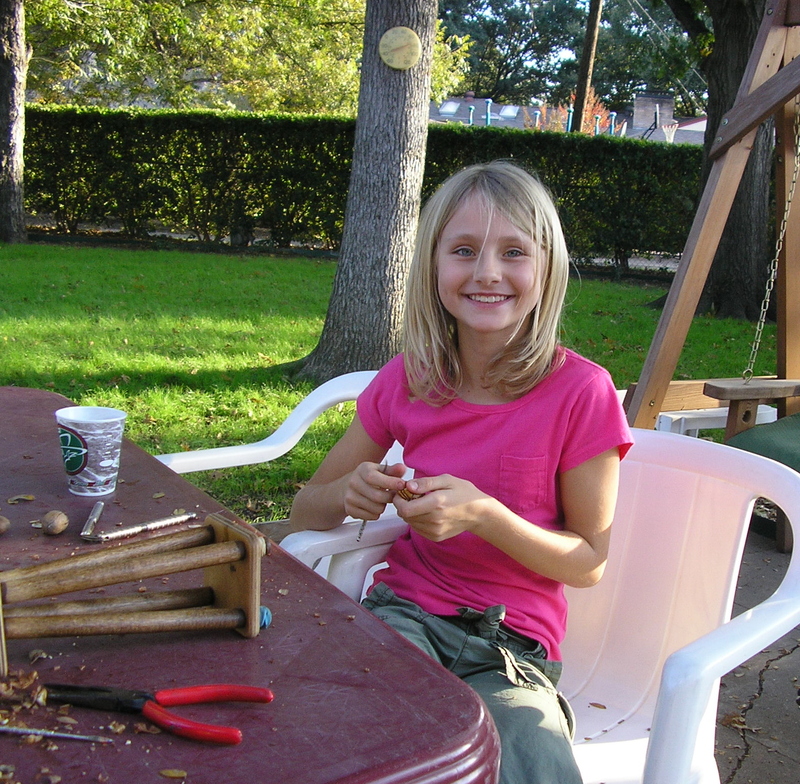 Leanne already made two pecan pies. Yum! We started off the weekend with a fall fest at the kids school. The parents and teachers who put this together did an excellent job giving the kids an opportunity to have fun and the adults a chance to socialize with each other. Leanne and I sure enjoyed talking with parents of our kids’ friends. And I was amazed that many of the conversations went beyond surface level stuff. This kind of an event is a reminder of how important it is to make sure we are in the world (not of the world), so we can rub shoulders with others – especially those who are far from God. The weekend will finish up with a fall fest at our church. I will miss it as I will be traveling; however, I’m sure it will be a great time to celebrate the onset of fall while having an awesome time with friends from the church and their friends. Until the next post, watch out for those falling leaves. Most people who know me also know that my family is spread all over the United States. My parents and one of my brothers live in Texas. My other brother lives in Wisconsin. My grandma lives in Illinois. My grandpa lives in Minnesota. My sister-in-law and her family live in South Carolina. And my wife’s parents live on the other side of Pennsylvania. We have often said that living in a mobile society really stinks. It is much more difficult to get together since we are spread apart. Another thing that we have often said is that we’re so thankful for phones. Last night was a great example of this, I arrived home after my coaches’ meeting to a phone call from my brother David. It had been a few weeks since we had spoken, and honestly, the busy lifestyles that are part of both our families contribute to our challenge to keep up with each other. Growing up, David and I did not always get along especially through high school. In fact, we are very different for many reasons which don’t need to be listed here. The cool thing though is that despite our differences, our bond in Christ is a certain common ground that allows us to look past our past differences and enjoy each other’s company. I love hearing how things are going for my brother and his family. I also love getting to share the joys and challenges related to my own family. I’m very blessed to have a cool brother (actually two cool brothers) and a great family. Thanks to a generous man from our home team (small group), I took the kids to see the Reading Phillies play the Erie Seawolves last night. The Reading Phillies are the Double A League farm team for the Philadelphia Phillies, and the Seawolves are affiliated with the Detroit Tigers. Shane Victorino (the Philadelphia Phillies right fielder) was on a rehab assignment here, so there were lots of cheers for him. If you’ve never been to a minor league baseball game, I would highly recommend trying it. It is so entertaining. Besides the game which the Phillies won 8-6, there is literally on the field entertainment between every half inning. We saw the crazy hot dog vendor throwing hot dogs in the stands from his ostrich, inflatable blow-up bobble head people dancing on the field, vegetables racing around the field, people shooting foam baseballs into the stands via sling shots, people shooting t-shirts into the stands via train/air cannon, etc. The food is reasonably priced. We didn’t have to pay for parking. And we arrived home just 40 minutes after getting into our car. What’s best about the whole thing is that I got to spend six solid hours with my kids (counting the car ride to and from the ballpark). I look forward to making more memories like this.